Wooooo…… Hoooooo….. finally I did it without any assistance from anyone. 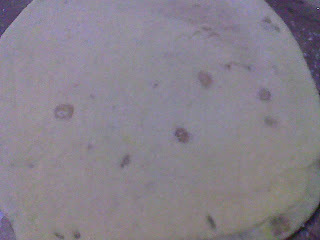 During my school days my work in the kitchen was only up to making dosas, idlis, making chappatis and of course rice. Also I was not ready to explore beyond that. After that I was busy with work and had no time at all. But after having children I had all the time and could explore all by myself. With puran poli it was the same. While at school all I had to do was cook them in the tawa and tuck it in. Amma used to prepare the dough in the morning itself and every one hour she will apply more oil and will keep kneading it. By the evening the dough will be very soft and pliant and she will make the poli by spreading it with her fingers in a plantain leaf. I had no patience for it. After marriage my MIL also used to make it the same way. Every time she visits us she will prepare the puran and dough and I will cook them in the tawa. I never did it all by myself from scratch. So when I came across sri’s roti mela I thought why not give it a try and rang up my MIL for instructions. She was as usual delighted. She loves cooking and always keeps me encouraging trying on something new. I told her that I was scared of making the purans as I have never done it before though I could manage the dough. She gave me a few tips which u will find at the end of this post if something goes wrong with the purans. Mix the flours together with the turmeric powder, 1 tbsp gingelly oil and salt and by adding little water steadily knead it into a soft dough. Keep aside for half hour. After ½ hour add one more tbsp of oil and again knead the dough and keep aside. 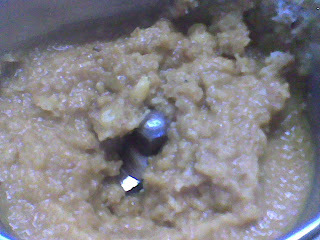 Pressure cook the Bengal gram for 1 whistle and after put them in a strainer so that no water is in it. 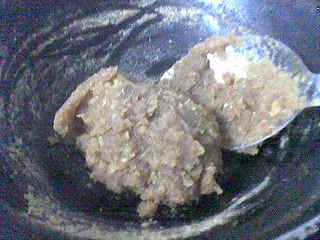 In a mixer grinder put the cooked Bengal gram, grated coconut, elaichi and jaggery and without adding water grind them till all of them are mixed together and coarse. In a heavy bottomed kadai heat the ghee and add the puran mixture to it and in a medium flame keep stirring it around till the mixture leaves the sides and comes off the kadai. This should take about 8 to 10 minutes. Keep aside and let it cool. Now roll them into small balls. Puran is ready. Take the dough and roll them into a big lemon sized balls. 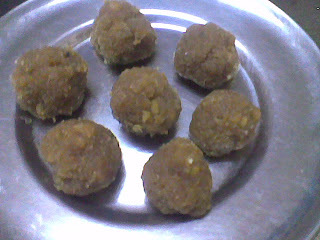 Take one ball and roll it into a small puri. Now keep one puran ball in the centre of this and cover it from all sides and make this in to a ball. 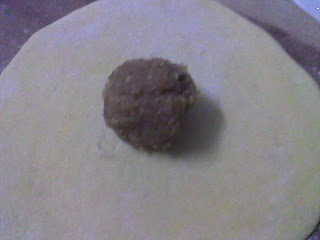 Roll this puran stuffed ball gently into a roti by sprinkling little flour to prevent them from sticking to the rolling pin. Be very gentle while rolling to prevent the puran from coming out of the ball. In a tawa cook these polis by applying ghee around them and flipping it over till they are cooked. Serve them hot after smearing some more ghee. I was apprehensive about the consistency of the puran and my MIL told me that if the puran becomes very thick and hard, sprinkle some warm milk over them to soften the purans. If the puran is very soggy and becomes incapable of being rolled into balls sprinkle some rice flour as it will absorb the excess moisture and the puran will become firm. It seems that I need not have feared at all. 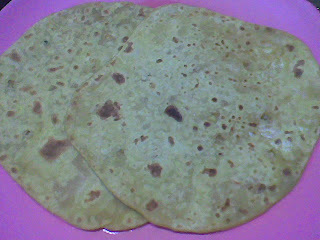 The puran poli came out very well. The children were very happy with the result and told me that I could make them often and they need not have to wait for their Avva’s (Grandma) arrival to taste the polis again. 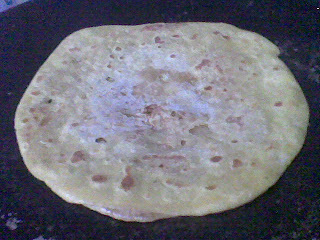 This puran poli is going to find its way to Sri’s Roti Mela and also to Mythreyee‘s Sweet Series. Looks yummy. Can you send this to Sweetseries event in my blog? Thanks. Thank you so much for the lovely entry. Radhika..they look great!..thanks for the entry!